Augustus Funeral Home regrets to announce the passing of Janet Diane Isabella Stuart. 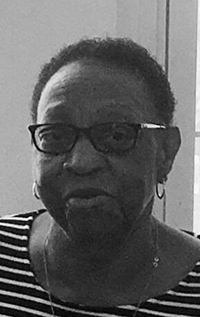 A service celebrating the life of Janet Diane Isabella Stuart, wife of H. Gerald ‘Toby’ Stuart, mother of Tanya Stuart, daughter of the late Percival ‘Sikes’ Raynor and the late Florence Raynor, in her 81st year, of 25 West Park Ln, Pembroke, will be held today April 20, 2019 at 12:00 pm at New Testament Church of God, Heritage Hall Worship Center. Interment will follow at St. John’s cemetery. Relatives and friends may pay their last respects at New Testament Church of God, Heritage Worship Center Today April 20th, 2019 from 11:00 am to 11:55 am. She leaves to cherish her memory beloved dog: Apollo; brother: Frederick Raynor; brother In-law: Kenneth “Stretcher” Dill; sister in-law: Marie Carter; nephews: Gary, Gregory, James, Steven, and Anthony Raynor, Kenneth “Bootsie” Dill Jr., Tracy Woolridge, Lynn [Cheryl Ann] and Lyle [Carmelita] Millett; nieces: Anna “Laverne” Pennyman, Veronica [Colin] Robinson, Debra [late Maxwell] Burrows, Andrea [Arthur] Lasalle, Darlene [Kevin] Bean-Walls, Erica Raynor, Dawn Gibbons, Deborah Rawlins and Lynette Arnold; special great and great great nephews: Max [Kayla] Burrows, Antoine Raynor, Blair Bean-Walls, Yndae Raynor, CJ Robinson, Amari Pratt; special great and great great nieces: Romica, Renee, Yndia and Y’Kira Raynor, Kijana [Juan] Millett-Pratt, Zanaeyah Pratt; special cousin: Dinah; godson: Floyd Smart: goddaughter: Sharon Maybury; special friends: Marlene and Roger Hart, Sybil Trott, Edith Moore, Marion Paul, Judy Gilbert, Marlene Manders, Sue and Reggie Myers of Georgia, Madeline Richardson, Gloria Tucker, Beverley Hollis, Ms. Lambe, Mrs. Parker, Dean Douglas, Shannon Simmons, Dwight Hart, Ms. Nolan, Mrs. Norma Smith and Family, Gerald and Vanessa Swan, Pastor and Co Pastor Burrows and The West Pembroke Pentecostal Assembly Family, Mother’s Day Brunch Girls, Bank of N.T. Butterfield and ProServe Staff and many others too numerous to mention.